The Portland DAMA Chapter has six new Certified Data Management Professionals after this week's CDMP Bootcamp! 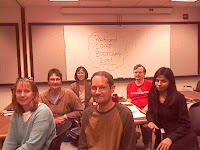 The first Portland Bootcamp was held on August 25-26, 2008 at The Standard in downtown Portland, OR. On Day 1, the class drilled through sample questions and discussed topics on the Core I.T. exam in the morning. The collective contributions from the class participants helped everyone gain a better understanding of linear programming, accounting and statistics. For many it was just digging out buried knowledge and remembering it was there! After lunch, the Core I.T. exam was given, and EVERYONE passed at the masters level on the first try! What a confidence builder! After that, the group was ready to tackle the Data Management exam, and after discussing the DM study materials for a couple more hours, the exam was given at 4:30 pm. It was a very long but productive day. After a long Monday, we decided to start day 2 with some quiet time to take specialty exams first thing in the morning or do some individual studying. Then we covered exam questions for the Data Warehouse exam and had some lively discussions about various aspects of data warehousing, the differences between OLAP, ROLAP, HOLAP and other relevant topics. This group clearly had some experienced data warehousing professionals! We ended the day with more exams for those who still had exams to take or retake. Overall it was a very fun and successful Bootcamp! I invite the participants to stay in touch and share their experiences in comments or guest posts on this blog as well.